Product Description (back cover): So you think you're a Disney expert... Sure, you may know the words to every Disney song and the names of every car in Radiator Springs. But do you know: A. The dentist's address in Finding Nemo? B. The names of the three good fairies in Sleeping Beauty? C. Which cartoon Minnie Mouse first starred in? D. Who said, "No capes. Now go on. Your new suit will be finished before your next assignment." Hakuna matata! All the answers are inside this A-to-Z guide. 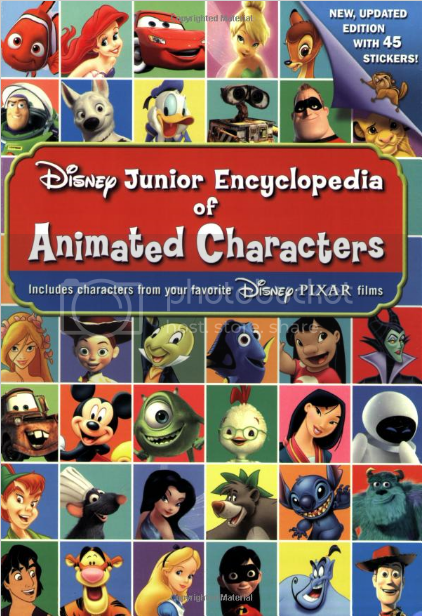 A brand-new, updated edition of the Disney Junior Encyclopedia of Animated Characters has the inside scoop! Go from Abu to Zazu...with stops Lightning McQueen, Stitch, and Tinker Bell along the way. Get fun facts, tricky trivia, and awesome quotes from the animated stars you've come to know and love. Then impress your friends and family! Where can it be purchased: The book can be found online at Amazon.com (Paperback version). Copyright © 2009 by Disney Enterprises Inc.